Huskies continue growing through their first year of life. Dogs go through distinct developmental periods just like people do. 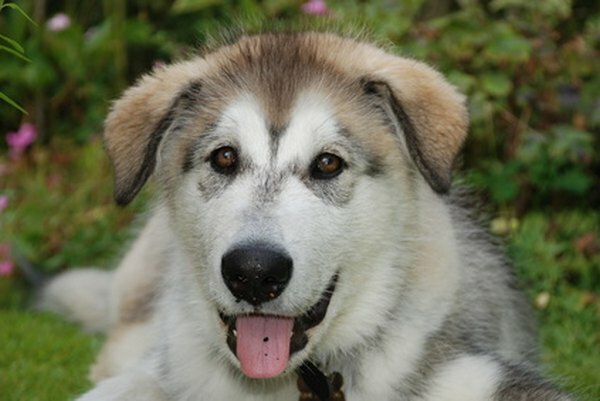 The early weeks of a dog's life are a time of rapid development, and huskies continue to grow and develop much longer than many other dog breeds. In the first few weeks after a husky is born, there's little that differentiates him from other breeds aside from his size and color patterns. All puppies are born with their eyes shut and rely on smell and fumbling around to locate their mothers. Between 2 and 4 weeks of age, puppies' eyes open and they become much more mobile. They also begin to display individual personalities, with some dogs barking, whining and eating more than others. Playing with littermates is an important part of this phase of development and teaches huskies basic social skills -- an especially important thing for large, intelligent dogs such as huskies to master. Mothers begin weaning their pups between 4 and 7 weeks, but puppies should not be taken away from their mothers until they are at least 8 weeks old. Between 8 and 20 weeks, huskies are primed to experience new sights, sounds and people. This critical period of socialization is the best opportunity to socialize your dog to other animals, people and unfamiliar settings. Your puppy may experience periods of increased fear at some points. Avoid rewarding the fear by petting or picking up your puppy. Instead, make interactions as positive as possible and reward your dog with lots of treats every time he displays bravery and plays with other people and animals. Fear in huskies can develop into aggression in adulthood. Puppies have small, razor-sharp puppy teeth that they begin to lose between 3 and 6 months. Your puppy will likely continue teething behavior for a few weeks after she gets her permanent teeth. Because huskies can be difficult to housebreak, you should continue house-training efforts at this age, and frequently reward your dog with treats when he urinates or defecates outside. Much of your dog's adult personality will already be established, but reward-based training can help ensure you have an obedient, calm dog. Growing puppies need plenty of exercise, so take your dog on a brisk walk or run at least once per day -- ideally more. Husky growth slows down between 6 months and a year, and your dog will likely be her adult height by her first birthday. Huskies continue to fill out until their second year, and some males take as long as 36 months to reach their full size. Your dog will also continue to mature emotionally and intellectually until she is about 2. By that time, her adult personality will be relatively stable, though it can still be altered by training. When Do Huskies Shed Their Coats? Can Huskies Be Cat Friendly? How Long Before a Dog Is an Adult?